In recent years, there has been a significant growth of interest in the Syrian Colony of the Lower West Side of Manhattan, frequently also called "Little Syria." This classic multiethnic neighborhood had a dominant Arabic-speaking influence from the 1880s to 1940s, and it served as the "Mother Colony" for the substantial Syrian and Lebanese immigration to the United States. The colony was the economic heart, as well as cultural and intellectual center, fostering an important literary movement that involved writers Kahlil Gibran and Ameen Rihani. Activists have worked to preserve the few remaining buildings on its central thoroughfare, Washington Street, and to memorialize the neighborhood through plaques, historical signs, and, ideally, "public art" in the newly planned Elizabeth H. Berger Plaza. Despite the increasing interest, there are still major gaps in the historical understanding. Indeed, up to now, there has never been a full book-length treatment of the colony. 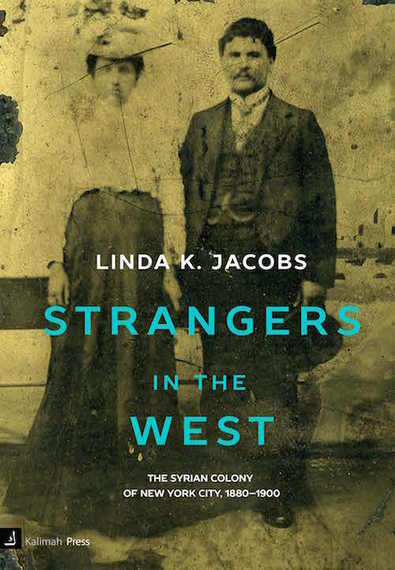 Officially released in October 2015, Dr. Linda K. Jacobs' Strangers in the West: The Syrian Colony of New York City, 1880-1900 corrects this and transforms the field. Through exhaustive review of newspapers, passport records, and other sources, she has constructed a database of every identifiable resident of the neighborhood, noting information such as age and religious denomination. Overcoming limitations from the destruction of the 1890 census in a fire, we now, finally, have some valid basis to discuss the demographics of the Syrian Colony in this period. However, the work does much more than just offer numbers; it provides colorful and imaginative profiles of the earliest Syrian immigrants (such as the media's sensationalized "Selma the Syrian Siren"). Jacobs attempts to understand how the immigrants saw themselves, looking, for example, at how they navigated, and sometimes abused for financial gain, Orientalist stereotypes. She describes her work on this book as "a labor of love" in admiration of these "pioneers--men and women--whose courage and spirit are so evident in everything they did." I have a feeling that many Arab-Americans will find the book a revelation in understanding a part of their history, and a part of themselves, that had become murky. In order to understand Linda's motivations better, I asked her several questions in the interview below. Copies of the book can be ordered now from Kalimah Press or from Amazon. Writing the first full-length historical study of the "Syrian Colony" in New York City, you encountered a good deal of conventional wisdom about the immigration and this neighborhood that had never been truly substantiated. What are some of the most important discoveries you made that deny conventional and popular understandings of this history? You hit the nail on the head! The original impetus for my book was to explore the typical family story that had been handed down unquestioned and unchanged through the generations: the first immigrants arrived penniless, peddled notions and Holy Land goods for a few years, were able to save enough to start their own businesses, and eventually reached the pinnacle of success. In my research, I found that the facts contradicted the narrative I had been raised with in many crucial ways. In my family, as in many others, a story of betrayal and failure was buried within this story of success. This discovery led me to look more deeply into my family's history, and this led to the surprising discovery that almost no scholarship had been written about the earliest Syrian immigrant colony in New York City (of which all of my grandparents were part). The motivation to correct this lack of knowledge transformed my initial investigation into a full ethnography of the community. It became clear to me that, like in all communities, there were wide variations in life experiences, some of which fit the "success" myth and many of which did not. In my view, it was important to show this variety in all its glory and sorrow. For me, the "failures" in the community were just as moving as the "successes." The other story that was important to investigate was the notion of a community of Arabs of different religions living peaceably alongside their American neighbors in this lower west side enclave. Although there were four different religious groups represented in the Syrian colony in the 19th century, they were exclusively Christian. A few Syrian Muslims and Druse did come to the United States in the nineteenth century, but they did not settle in New York. Even among the Christians, there were violent conflicts, not to mention battles with their Irish neighbors, which led to fistfights, arrests, and in one case, a murder. There were a number of suicides as well. None of these facts fit the myth, but in my view, they humanize a group of people who had been living under a burden of a benevolent whitewashing promulgated by their descendants. A core element of your study is storytelling, and you offer colorful anecdotes regarding exceptional individuals and episodes in the New York Syrian Colony. Was this approach a conscious effort to humanize an ethnic group about whom there is a lot of confusion? What did you find most remarkable about this immigrant cohort? Yes. The stories I tell usually take the form of mini-biographies of the members of the colony. I must say that each and every early Syrian immigrant is fascinating in his or her own way, and there are hundreds of great stories to tell. More importantly, collecting these stories is an act of memory-preservation, because the members of the first colony had been largely forgotten (as had the colony itself), even among their descendants. I felt it was imperative to bring them to the consciousness of Arab-Americans, as well as to the larger American population. Despite the fact many people assert that the Lebanese and Syrians are natural masters of assimilation, able to adapt to any environment, you titled your book, "Strangers in the West." Does this title signify your identification of a significant culture shock during the 19th century migration? Do you believe that the immigrants from Syria had an assimilation process that differed from immigrants of European origin? Evaluating this question has been a difficult process for me because on the one hand I'm a historian looking at data that clearly show the ambivalence in the Syrian community about assimilation, and on the other hand, I'm someone whose maternal grandfather embodies in many ways this stereotype of a "master of assimilation." As is probably true of every immigrant community, there was an ongoing discussion among the members of the Syrian colony as to whether and how they should become "American." In the beginning, they thought of themselves as "birds of passage;" that is, they planned to come to America, make their fortune, and return to Syria. It wasn't until the last decade of the nineteenth century that the idea of staying took hold and became a topic of debate. The argument focused mainly on how one could succeed in America without giving up the values that were considered core to the Syrians and their identity. Every person had his or her own way of resolving this concern. The other important thing to realize, and a phenomenon for which little data exists, is that many people did go back to Syria and never returned to America again. Whether this was because they had failed in America or because they had succeeded so well they were able to return and live comfortably in their homeland is not at all clear. But in every account of American Syrians visiting their homeland, there are descriptions of men who had returned after migrating and settled down. Understanding this phenomenon better is a study that still needs to be done. The majority did stay in America, however, and they were able to make peace with their adopted homeland, despite being "Strangers in the West" (a title taken, by the way from one of the earliest Arabic books published in the United States). Your book focuses on the 19th-century period of the Syrian Colony's existence, which most people terminate ultimately with the construction of the Brooklyn Battery Tunnel in 1946. Did this focus emerge because of an interest in the "origins" of the colony, because this period was more manageable for your forms of historical research and analysis, or because of a simple preference for this time period? Did something significant change at the turn of the century that you believe is important to recognize? The origins of the community were fascinating to me, not only because my grandparents came in the early years, but because the New York community was the center of the North American diaspora--culturally, economically, religiously, and intellectually. I don't want to make too much of the 1900 cutoff date for the book. It was a convenient date because the 1900 federal census is the first that details a quite large cohort of Syrians in this country and in New York. So starting at 1900 allowed me to work backward to the two decades of Syrian immigration before that. Yet, this date also serves as a symbolic tipping point for the Syrians in New York in several ways. By 1900, one-quarter of the Syrians were living in Brooklyn (a trend which would contribute to a substantial reduction of their presence in Manhattan by the 1930s). Also, by 1900 many of the earliest immigrants who had started out as peddlers had established their own businesses, whether in manufacturing, importing, wholesaling, or mom-and-pop retail stores. All businesses remained in Manhattan, even as people were moving to Brooklyn. The Syrian community in New York preferred self-employment, and this practice persisted in the twentieth century. Strangers in the West: The Syrian Colony of New York City, 1880-1900 is available now from Kalimah Press or from Amazon.